The Scott Crew transferred to the 492nd at Alamogordo, New Mexico, as crew 1113 from the 32nd CCTS (Combat Crew Training School) in Tucson, Arizona, on 5 Jan 44. There was one possible change in their crew roster. Pfc Reynolds doesn't appear on any roster going to England and we can't find any record of a replacement. 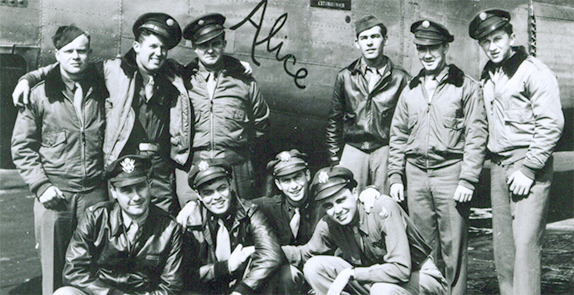 The Crew was assigned to the 857th BS, designated as Crew 712. Lt Robertson Scott signed out for a brand new B-24J Liberator, 44-40136. The crew gave it the nickname SILVER WITCH because its skin was unpainted aluminum or, as they say in the Air Corps, NMF (Natural Metal Finish). In April of 44 they took their ship to England flying the southern route. Their ground Crew Chief S/Sgt Way went with them, bumping Sgt Gilbert onto the Queen Elizabeth. The Scott Crew 712 was one of the six crews that completed a full tour of 30 missions while with the 492nd. None of the men missed any of their missions as no one was ever wounded or too sick to go, even though they flew more than their fair share of the tough missions. One amazing story they tell is of the Group's first deadly air battle with the Luftwaffe on the 19 May mission to Brunswick. The Scott Crew was smack dab in the middle of it. Although they were vastly outnumbered by the Luftwaffe, the battle was fought tooth and nail. Tracer bullets were seen everywhere. Burning planes from both sides were falling from the sky. Yet, somehow this crew got through it. They had fully expected to see their plane riddled with bullet holes when they got back to North Pickenham. Astonishingly, they couldn't find so much as a small scratch. They survived the Politz mission on 20 June as well. It was the 492nd's worst day, as they lost 14 crews. The entire 856th Bomb Squadron was wiped out as well as portions of the other squadrons. Again, Scott and company seemed to have had a guardian angel flying on their wing. The crew's final mission was another rough one, perhaps their toughest one. The flak over Hamburg was thicker than anyone in the 492nd had seen before or since. Just after they dropped their bombs, their plane took several hits, knocking out one engine and damaging the super chargers on two others, which made them almost useless. They had to drop out of formation. With only one good engine still intact, the plane went into a steep dive. The German Flak guns tried to hit them on their way down by shooting a pattern into their projected path. Lts Scott and Reisman kept their eyes on the developing patterns and managed to correctly outguess the Germans and dodge their killer shots. Super chargers aren't needed below 10,000 feet so once the Scott Crew got to low altitude they regained full power to the two crippled engines. Flying alone with black smoke trailing from the ship, they would have been easy prey had the Luftwaffe seen them. With this in mind, Lt Scott did not level off his ship until they were about 100 feet above sea level. As they got over the North Sea, a P-38 picked up on them and escorted them home. Buzzing the base was an unofficial tradition for all air crews returning from their final mission. By unanimous vote, the crew elected NOT to buzz the base upon their return. They knew they had been extremely fortunate and they shouldn't push their luck. Page last modified Thursday, March 27, 2014.